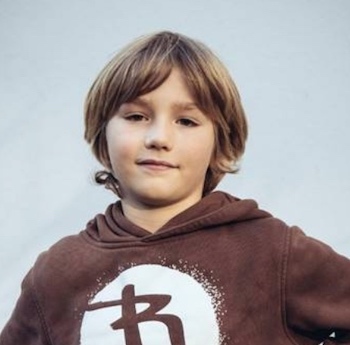 Emil Rustige, born in 2010, is an adventurous and inventive kid, enjoying long travels across continents with his parents when he was only three years old. He engaged in building huts in the woods as well as inventing a pancake-cooling-machine. And he loves soccer and is an enthusiast percussionist. But one day he got annoyed that his parents seemed to stare more at their phones than talking to him. He started to tease his father every time when his head dropped down, glued to the little screen. “Hey, everybody seems to be locked into their mobiles, nobody is talking any more!” He looked at the people around him, on the train, in the restaurant. Everybody seemed to be busy at least as much with the gadget as with each other….. And it occurred to him he should do something about it. “Papa, I want to organize a demo against parent’s using their phones instead of talking to their kids. Against always using this gadget instead of talking to each other.” And he didn’t let go of talking about the idea until the parents agreed to help him organizing a demo in their Hamburg neighborhood, proudly headed by their son Emil. The event met with amazing public response. Here something went into the other direction than what was generally the official concern: overuse of smartphones by kids. Could it be that the parents were the culprits in the first place? And thus, the video of the event went somewhat viral and found it’s way around the globe and to the university of Michigan where a group of students and teachers picked it up and upgraded it to a little film about the dangers of smartphone addiction with mothers and their toddlers, in family live as well as in the general public. When we contacted Emil’s father and asked him whether he thought that Emil would fit in with the Giraffe Heroes community they first had a good look at what this community represented. Emil was enthusiast and wanted to be part of it. So we are glad to welcome him to this new kind of family and wish him our very best on his way into the not so easy future of the planet.